Ginkgo Biloba - Also known as Memory Tree. A fresh herb tincture, indicated to improve circulation. 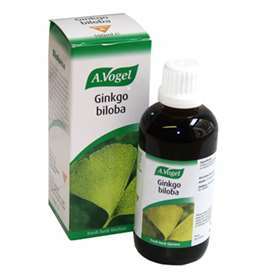 People with cold hands and feet, tinnitus/dizziness, Raynaud's disease, chilblains, poor short term memory and any condition will all benefit from Ginkgo Biloba where arterial circulation is impaired. Add this tincture to water and drink. Ginkgo Biloba is a specific anti-oxidant that protects cells in the central nervous system form harmful free radicals. Ginkgo Biloba also acts on improving oxygen and glucose delivery to tissues and improving the flow of blood through the capillaries. This is how brain function is improved as it requires a lot of energy.